A few weeks back I posted an interview with Anthony Hughes where we highlighted his Industrious Senesence wood flooring product that features screen printed images and text on the face of the planks. Industrious Senesence incorporates numerical and textual imaging in its design. Prior to that I highlighted the work of Fontenay’s Vintage Barrel Wood Flooring collection that is produced from reclaimed wine barrels. Fontenay’s product also features text and numerical printing on the planks which were originally stamped by the cooper or the vintner. Wine Barrel Wood Flooring exhibits the text markings from both the cooper and the vintner. The emergence of products that exhibit textual or numerical images points to a trend in wood flooring. Let’s look at some more examples of this trend I’m seeing in the marketplace. WFT‘s good friend Richard McKay from Glasgow designed Whisky Barrel Flooring to find a use for the thousands of spent whisky barrels that go out of use each year. Rather than sending these barrels to the landfill, Richard’s creation has become a wood floor sensation and the product is highly sought after the world over. By the way, is it whisky or whiskey? At left: The head of a spent whisky barrel with branded insignia. At right: Transformed into wood flooring this product becomes a design feature with a great story to tell. From re-purposing actual wine and whisky barrels into wood flooring this next example moves from making flooring out of the container the wine was aged in to making a wood floor out of the crates the final product was shipped in. 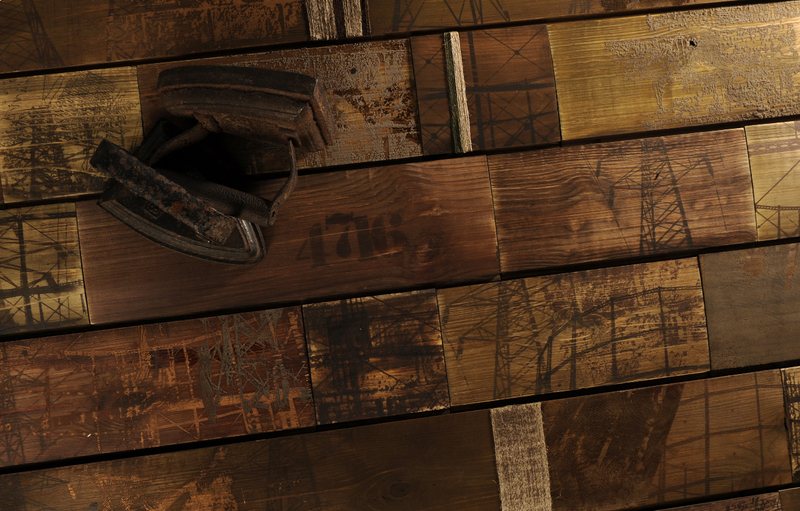 Reclaimed wood flooring made from old wine crates. Photo courtesy of poetichome.com. CAUTION: The following material may be inappropriate for true wood flooring professionals. If you feel any type of flooring material other than hardwood flooring is inferior and thus offensive you may want to skip the next paragraph. I’m going against my better judgement on this next example. I have tried to be careful to only promote real wood floors on this site and stay away from all other types of flooring. However due to the nature of this post, I’m going to make an exception and highlight one laminate floor product from the German laminate manufacturer Parador. To be certain these are not real wood floors, but you do have to give Parador a high-five for pushing the design envelope with these products from their Trendtime lines of laminate flooring. Two of these products are made to mimic flooring made from wine crates as we saw in the previous picture. 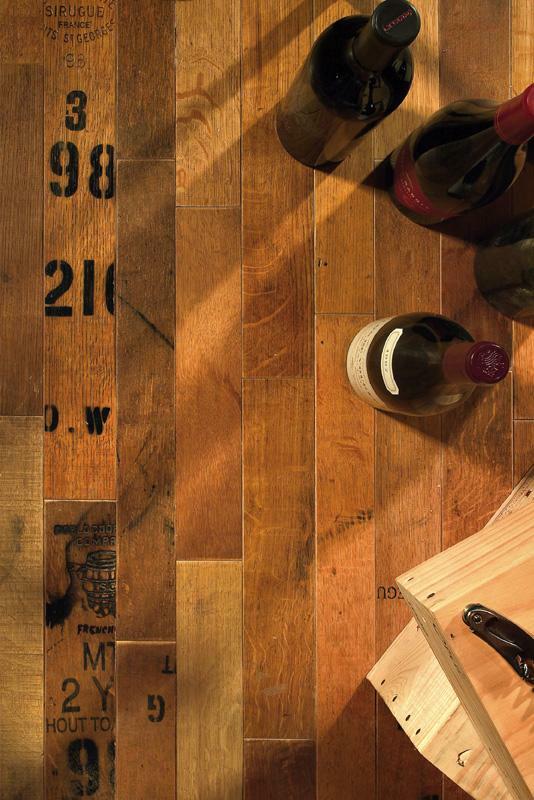 The two above products from laminate manufacturer Parador are made to mimic wood floors made from wine crate material. These second two laminate designs push the bounds of textual and numerical design further. The picture below left, a product called “Letter’s Black” are black laminate planks with entire history books inscribed on the floor. This would be perfect for college dorm rooms. Get your text books printed onto the floor, then if you have a little too much libation at least you can study while lying on the floor. Above left: An entire history book is printed on this laminate floor. Above right: This must be the large print version for folks who need glasses. The photo above right from Parador’s laminate line Trendstime, brings me to one final example of flooring with textual or numerical imaging. This next example made headlines last spring as the Seattle Public Library was fitted with a maple wood floor designed by Ann Hamilton. The product began as 2 1/4″, 3 1/4″, 4″ and 5″ Clear Hard Maple from Sheoga which was then routed out in the design of 11 different opening lines from classic books. You can read the entire amazing story of this floor at Hardwood Floors Magazine. Maple wood floors from the Seattle Public Library. 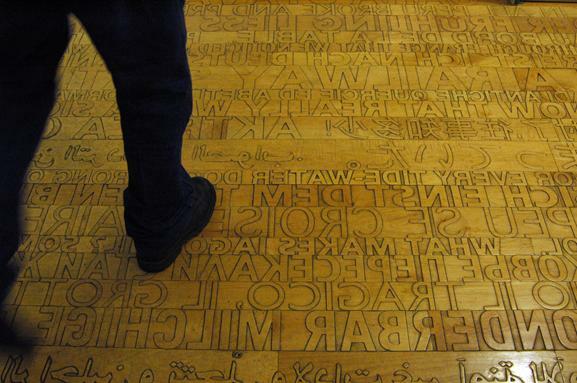 The raw flooring was routed out to form textual relief in the form of opening lines from classic books in 11 different languages. All of these examples point to a continually emerging trend both toward reclaimed wood flooring materials but also to an openness and desire on the part of homeowners and project managers to employ the use of products that truly tell a story. Your work is excellent. I really like the wine crate flooring. 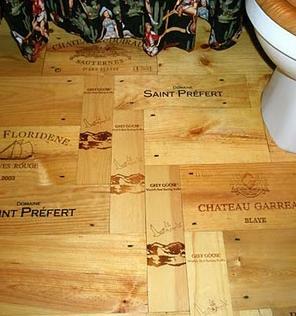 It’s definitely one of the more difficult wine crate projects, and it almost always requires a flooring professional.